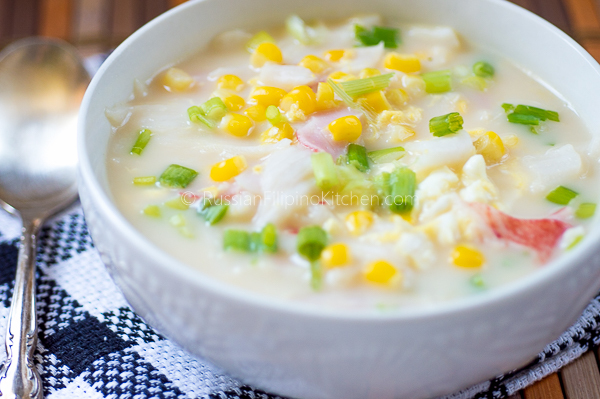 This creamy crab and corn soup is one of my favorite soups to enjoy during colder months. It’s quick and super easy to make, yet full of flavor. It’s still summer here in California where I live, but the temperature dropped to high 70’s (ºF) yesterday. It was perfect to have some soup for lunch. I made a huge pot and gave some to our neighbors. I took some photos as well so I can share this recipe with you all. 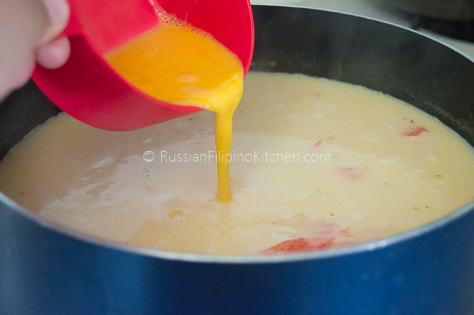 In Philippines, real crab meat is very expensive so most Filipinos only have the chance to eat crab and corn soup by buying a packet of ready-to-mix Knorr soup powder, add some water to it and let it boil in a pot. Once the soup has thickened, you then add one beaten egg at the end. I did that so many times before. But there’s nothing more satisfying than making this delicious soup with real ingredients. I mean to say a soup you can enjoy where you get to taste the meat, the corn, and green onions. Not the kind where you barely have anything in it except for a couple pieces of dehydrated corn kernels and green onions in every scoop. 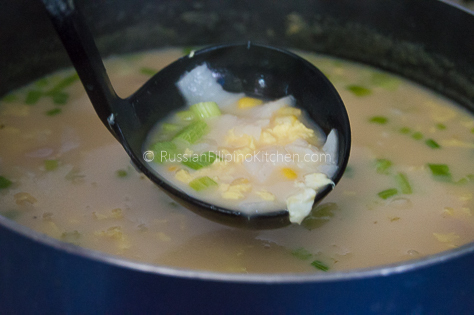 This is my version of crab and corn soup, also known as crab and corn egg flower soup popular in many Chinese restaurants. I use real crab meat when available but oftentimes I just settle for a good quality imitation crab meat from our local grocery store. Imitation crab meat is made from fish so it’s still good substitute. I always add milk to the soup to make it creamy and a little bit cornstarch for a little bit thicker consistency. Since this is a rather thick soup, it can be eaten as a meal in itself. I hope you try it and if you do, please let me know how it goes. Enjoy! 1. Fill cooking pot with 8 cups cold tap water. 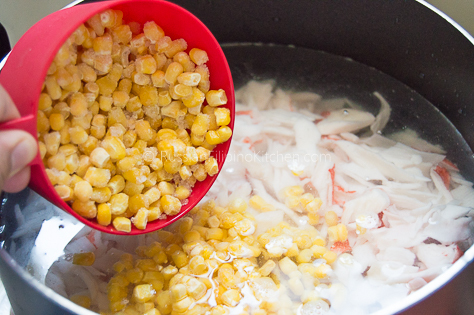 Add the crab meat, corn kernels, and bouillon cube. 2. Place pot on the stove and cover, then turn on heat to high and bring to a boil. As soon as it starts boiling, remove lid and lower heat to medium low and simmer for 15 minutes, stirring occasionally. 3. Add the milk into the pot and stir.Let it simmer for a couple of minutes. 4. 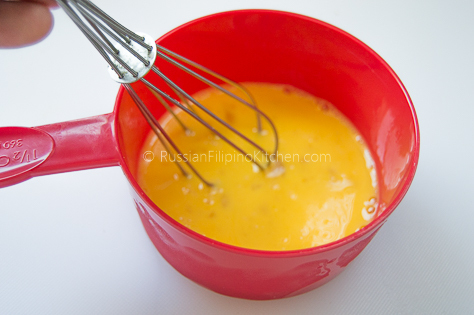 Crack eggs into a bowl and beat lightly using a whisk or fork. 5. Drizzle beaten eggs slowly into the pot, allowing it to cook a little, then stir to disperse. Cook for about a minute. 5. 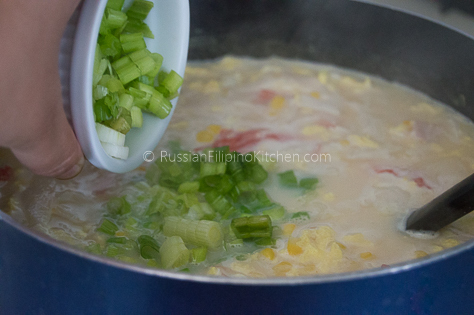 Turn off heat and add chopped green onions, and salt and pepper to taste if desired. Stir and allow to sit for a minute or two before serving. 6. Scoop into individual soup bowls and serve hot. 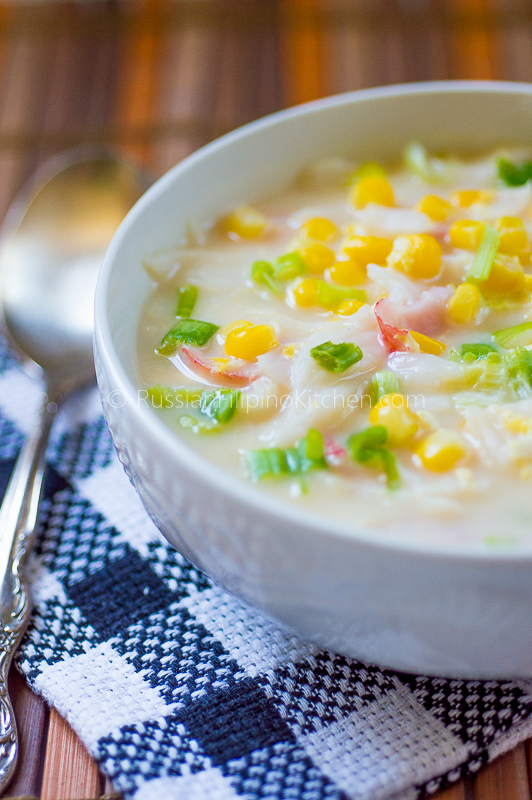 A quick and creamy crab and corn soup that's ready to be enjoyed in 30 minutes. Fill cooking pot with 8 cups cold tap water. 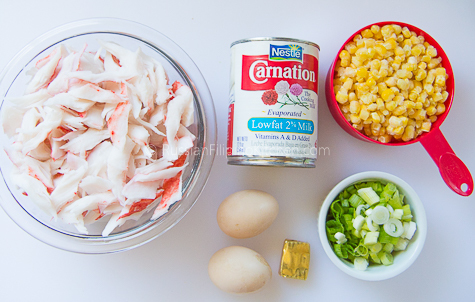 Add the crab meat, corn, and bouillon cube. Place pot on the stove and cover, then turn on heat to high and bring to a boil. 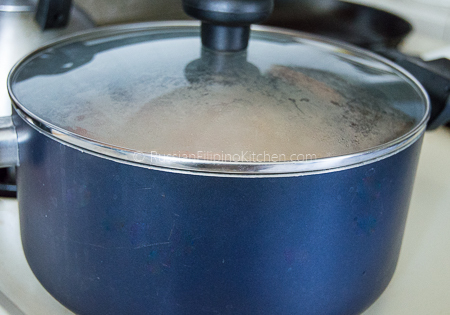 As soon as it starts boiling, remove lid and lower heat to medium low and simmer for 15 minutes, stirring occasionally. Add the milk into the pot and stir.Let it simmer for a couple of minutes. Crack eggs into a bowl and beat lightly using a whisk or fork. Drizzle beaten eggs slowly into the pot, allowing it to cook a little, then stir to disperse. 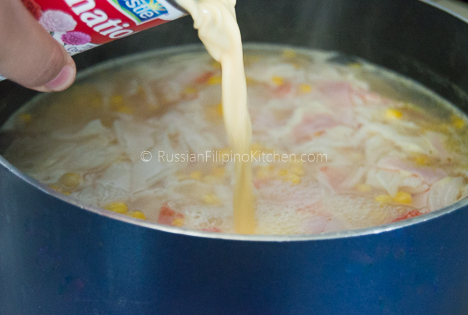 Add dissolved cornstarch and cook for about a minute, stirring constantly to prevent lumps. Turn off heat add chopped green onions. Also, add salt and pepper to taste if desired. Stir and allow to sit for a minute or two before serving. Scoop into individual soup bowls and serve hot.